Avid readers of my blog will notice that I’ve written about Sakana-tei before. Indeed, repeat reviews are not the norm for me, but our fantastic meal there last Friday was so full of unusual offerings that I felt it warranted a second mention. This small unassuming Japanese eatery situated on the same street as heavy-hitters Hibiscus and Goodman (just off Regent St) is such a gem I’m constantly baffled as to why it isn’t better known. This could be due in part to owner Fumio-san’s desire to keep the operation small – he has proudly informed us (on many an occasion) that all his business comes through word-of-mouth, and that despite being fully booked most nights he has never looked to expand from the tiny premises as he wishes to maintain a manageable number of tables that he can look after properly. Sakana directly translates to “accompaniment for drinks” (and tei to “house”), so it is unsurprising that the restaurant is modeled around an izakaya, a traditional drinking establishment serving snacks that one would find in Japan. Japanese businessmen (who make up a large percentage of the customer base) come here with the view to spending an entire evening – beginning with starters and a few beers, then moving on to sushi, fried items and simmered dishes (all washed down with sake), before ending with grilled riceballs (yaki onigiri) or a bowl of fresh noodles and a couple of whiskies. There is an English à la carte menu (bearing all the usual suspects), but for those in the know, the real menu is painstakingly written in Japanese on a portable chalkboard. Although the standard items are impeccable, I would highly recommend ordering at least a few (if not all) of your dishes from the specials board. On this particular visit we were seated at the sushi bar as all the larger tables in the cosy basement were taken. It made for a nice change and we found that we actually preferred it upstairs, and watching the chef work in between courses was a welcome distraction. As usual Fumio-san did the ordering for us and he really wowed us with his choices. 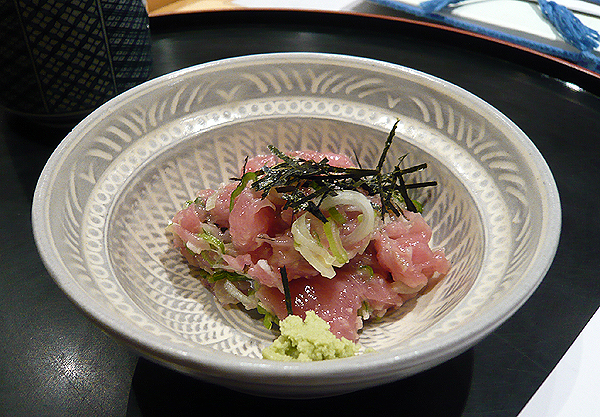 First up was a starter (on the house) of Negitoro – chopped up toro (tuna belly) mixed with sliced spring onions. Fresh, luscious, and absolutely delicious! It’s interesting to note that they usually have two house appetizers, one for western palates (usually a simmered dish of some sort) and another for the regulars and Japanese clientele (the Negitoro would be reserved for the latter). Fumio-san knew that B is a big fan of Shiokara (fermented seafood) so served us some Fermented Squid and its guts – salty, pungent and definitely an acquired taste – this dish is not for the faint-hearted! 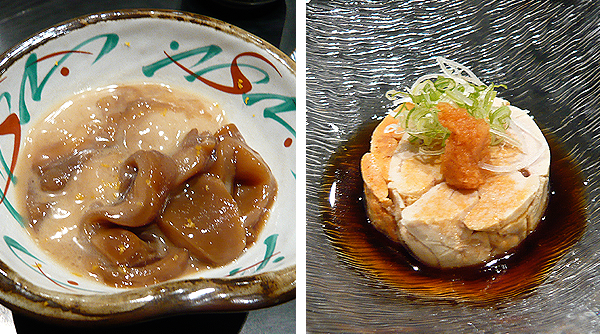 I wasn’t as crazy about it as B was, but the Monkfish Liver (steamed, then bathed in a tangy ponzu sauce) that arrived in tandem was nothing short of spectacular. We were audibly appreciative as we ate what is dubbed as “foie gras of the sea”, and as we oohed and aahed over each delicate creamy mouthful the sushi chef glanced over and smiled knowingly. 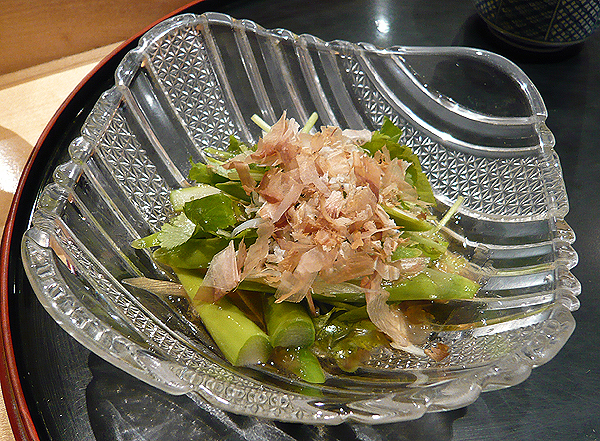 A simple Asparagus and Whitebait (the miniscule Japanese variety) Salad came next. Tossed with shredded aromatic miyoga ginger and a light vinaigrette, the flavours were bright and clean, making the salad a perfect interlude between the previous dishes and the sashimi platter that was to follow. We had casually mentioned that we were in the mood for some top-notch sashimi, and were not disappointed with the assortment chosen for us – the thick, glistening slices of fish included Otoro (the highest grade, and fattiest of tuna belly), Hamachi (yellowtail), Tai (Sea Bream), Razor Clam, Sea Snail and Sardines (served with grated ginger and thinly sliced spring onions). As we were eating Fumio-san strolled over, pointed at the sliced sea snail and gave it a thumbs-up (it is apparently his favourite). Everything was incredibly fresh, and served with both freshly grated wasabi and Kizami wasabi (which we have not seen served anywhere else in London) – a premium chopped wasabi. 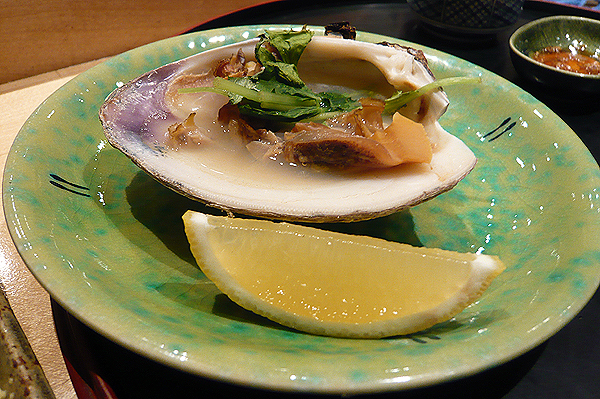 A giant clam I had requested came grilled and topped with a beautiful sake broth. Again, the mollusc was exceedingly fresh (they are also offered as sashimi), although certain bits were a little tough and annoyingly got stuck between my teeth. 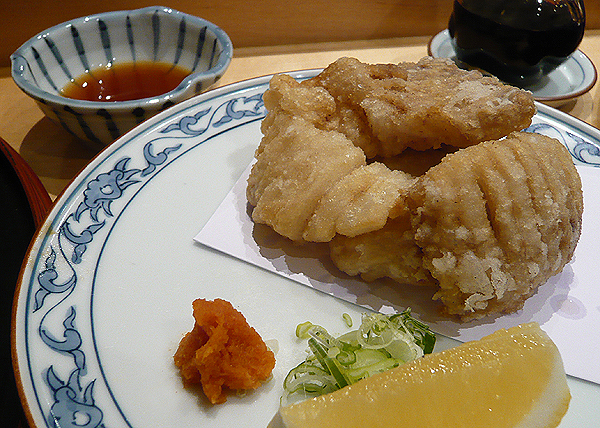 The lightly battered Tempura of Skate Wing that followed was light as air and not at all greasy. It had an interesting moreish texture – the crisped gelatinous edges were slightly chewy, and gave way to softer meatier flesh in the middle. 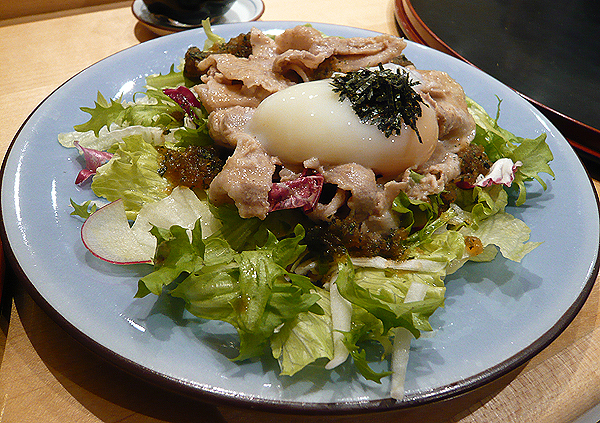 I absolutely adored the next dish – tasty thin slices of Pork over a piquant dressed salad topped with an Onsen Egg (or “spa” egg, so named as it is slow-cooked in a water bath). Humble ingredients and not much to look at, but with the yolk broken and all the components put together in one mouthful it was simply sublime. After the salad there was a bit of a lull – this happens sporadically when dining at Sakana-tei as they like to give you time to breathe between dishes and often diners will order two or three times during the evening to really drag out the meal. The two Japanese men next to us at the counter popped out for a 15-minute smoke break thrice during our meal (they were not even halfway done when we left); everyone is left to eat at their own pace – there is no turning over of tables here. 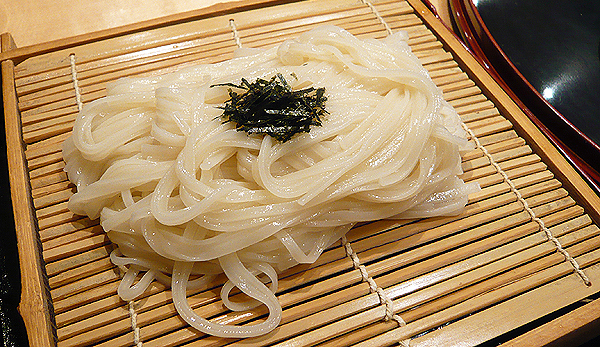 When our last dish of Zaru Udon (cold wheat noodles served with a ginger soy dipping sauce) eventually arrived we were pretty stuffed, but the noodles slid down easily. They had a pleasing bite of freshly-made noodles (all their noodles are made in-house) and the coldness made them a lovely refreshing finish to our dinner. This meal was full of firsts; apart from the sashimi and udon we have not had any of the other dishes on previous visits. And that is part of the joy of dining here – sure, we have our tried and tested favourites, but there’s also always something new to discover, with every meal being a culinary adventure. Don’t come expecting chichi surroundings or an amazing atmosphere, but if it’s seriously good Japanese fare you’re after (and you have 2 or 3 hours to spare) then you need look no further. ~ by gourmettraveller on March 15, 2010. My god, this place sounds and looks fantastic. What a hidden gem – would love to visit soon! Wow, the food looks good. Hi GT. Nice follow up review, I still need to check out Sakana-tei’s evening menu. By striking up a rapport with Fumio san, you seem to be getting their A-game and that’s got to be the way to go. Btw I notice that you finally made it to Shiori and were impressed which I am glad to hear. Just a shame that the chef can’t show off his repertoire of cooked dishes which is where his expertise really lies. Oh and thank you for the Chisou tip, I went back and was much more impressed than on a 1st visit in 2007. Excellent chirashi and a very likeable and chatty Hungarian itamae. Very exciting that they have uni from California although they didn’t have it the day I was there. I’m currently working near to Saki in West Smithfield, definitely worth trying if you haven’t been and worth knowing about their £5.50 takeaway lunchtime dons which are an absolute bargain for the quality. Lucky me, I should be on my way back to Japan in May with likely stop offs in Singapore, Malaysia, HK and Taiwan. Do you have any particular recs for Singapore? I haven’t been there in over 15 years! Yes, you definitely should! Glad you made it back to Chisou (and liked it). I did like Shiori but am not sure I’d go out of my way to return – would be great for those working nearby though. Good to know re Saki as I’ve been thinking of visiting – have you been in the evening? You are lucky indeed, it’s been too long since I’ve been to Japan! Off the top of my head two places you must eat at in Singapore are Iggy’s and Goto – both are a touch pricey but feature very accomplished cooking. I hear Les Amis is still impeccable although I personally have not been since Justin Quek left to set up in Taiwan. I’ve also heard good things about Jaan. On the less high end scale there is of course Chilli and Pepper Crab at Jumbo in East Coast – they now have a branch in the more central Dempsey development (which has a lot of restos, bars etc – v.popular in the evenings) but the original one is better, there’s a place that does fantastic pepper crab in Serangoon but it’s hard to find and requires queuing from 5pm. If you want to be adventurous there’s frogs legs porridge in Geylang, and of course the obligatory Hainanese Chicken Rice at Chatterbox in Mandarin Hotel (now on the top rather than ground floor so you at least get a few for the exorbitant prices!) but you can get just at good at the hawkers really. Thanks for the SG recommendations, I will look into these. I have a couple of friends based there so should get pointed to some more of the good stuff. Quite excited about discovering the food scene in Taiwan, I’ve been hearing lots of good things, it’s one of the few places in Asia I’ve not yet visited. Yes I have been to Saki in the evening but not since 2008. I remember being very impressed by the following items – uni tempura (off menu I think), aburi (“seared”) style nigiri sushi, foie gras with daikon, uni nigiri. We sat at the counter and worked out a menu with the chef ordering directly from him. Certainly more hits than misses and seems to have maintained standards in spite of changing executive/head chefs. Very good sake list as well if that’s your thing although comes at a price. Sounds like you are doing a Japanese circuit at the moment. I did something similar in 2007/2008, checked out places like Edokko, Mitsukoshi, Defune and Kiku. One place I have never been to but consistently hear good things about (especially from Japanese people) is Shogun in the Millenium Britannia hotel in Mayfair. Has this place made it on to your radar? Oonth, will you be visiting Justin Quek’s restaurant in Taiwan? Do let me know how your Asian eating tour goes – will be useful for when I’m next in the region! Re Japanese restaurants…I guess you could say that! I have heard of Shogun and my Japanese friend says her family loves it, so that will be making it on my “circuit” soon! (as will Saki). 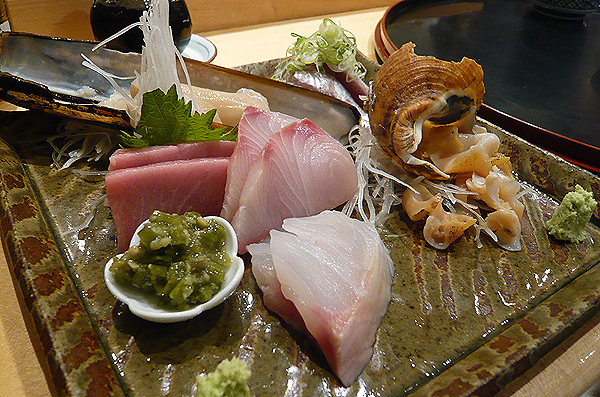 That looks and sounds INCREDIBLE – especially the ankimo and the sashimi plate. Am definitely going back for dinner. I would like to go there tomorrow for lunch! Hi Kei, I believe they are closed this week. Not sure if they reopen next week or in a fortnight – best to call and check!